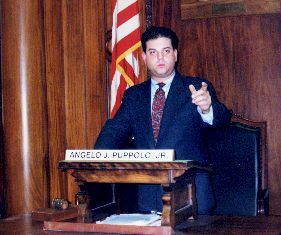 Angelo J. Puppolo, Jr. is a lifelong resident of the City of Springfield. He attended Springfield Public Schools and graduated from the former Classical High School. He is the son of the late former Springfield City Councilor Angelo "Duffy" Puppolo. His mother is Laura Puppolo, and he has a sister Maria. He is married to Isabel (Fernandes) Puppolo, and they have two daughters. Angelo passed the Massachusetts Bar Exam on his first attempt, and he is admitted to practice law in the Commonwealth of Massachusetts. In addition, Angelo is admitted to the Connecticut Bar, the Maine Bar, and the Federal Bar for The United States District Court. He works as an Associate in the Law Firm of Fennell, Liquori, & Powers; a general practice law firm. Angelo is an avid sports fan. In his spare time, he enjoys watching baseball, football and hockey games. He also enjoys collecting nautical antiques. Angelo also likes to attend the theater, and watch live performances of musicals and operas. 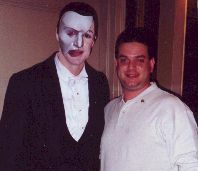 He is a big fan of the Phantom of the Opera, which is his all time favorite show. 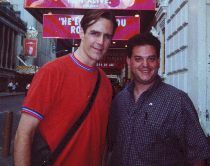 Angelo with Howard McGillin who plays the Phantom on Broadway. Before being elected to the City Council, Angelo served as Chairman of the Springfield Park Commission for two years. He successfully managed a four million dollar budget and not only improved Forest Park, But upgraded neighborhood parks throughout the city. Working with many bocce fans including Rico Daniele, Angelo was able to help bring the first bocce courts to Forest Park. He also worked to expand the Park Ranger Program, and he still remains active with the Rangers where he is an honorary chief. During his tenure as chairman, Angelo also helped with the success of Bright Nights at Forest Park. He also expanded programs for Springfield's seniors and youth, and made certain Springfield's parks remained open, clean, and safe. Angelo has given much of his time in helping numerous civic and fraternal organizations, continuing a family tradition of service to Springfield. He's worked effectively with business, community, union and government leaders and has gotten results. Angelo believes that every neighborhood counts. After serving on the City Council for just one year, Angelo was elected by his colleagues as the vice president of the City Council in 1999. Angelo was re-elected vice-president in 2000. Angelo was President of the City Council in 2001.